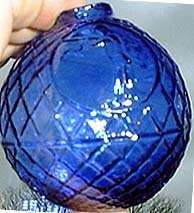 Target Balls are glass balls made to be launched in the air for target practice. Early examples were plain globes, but later they were made with ornamental patterns. Made in the USA from 1850 thru 1880, they quickly went out of production with the invention of the clay pigeon (too bad). Kovels' 1996 price guide has a section on Target Balls. 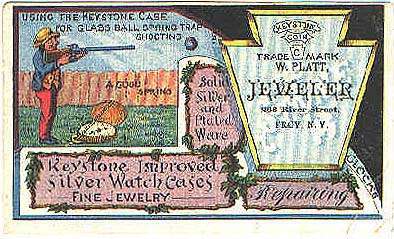 Below is a trade card for Keystone Watch Cases that shows a glass targetball launcher at work. 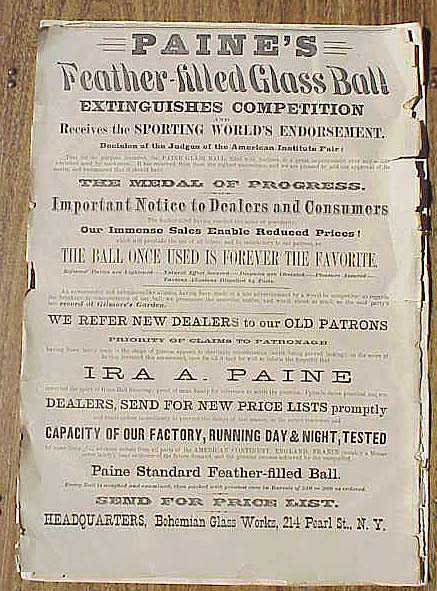 Click here to view ad for "Paine�s Feather-filled Glass Ball / Extinguishes Competition and Receives the Sporting World�s Endorsement". Neat ad, lots of information, appears to be within a couple of years of the invention of Paine�s glass ball, as it mentions how his factory should be able to supply orders if ordered promptly "to prevent the delays of last season". Also mentions the location of The Bohemian Glass Works, 214 Pearl Street, New York. The ad was included in a May 24, 1879 issue of Scientific American, and there are about 8 pages of the issue included with this, several of them have some very interesting engravings as well. Measures 10 3/4" x 15 3/8". See Glenn Poch's newsletter articles on Target Balls: First and Second.